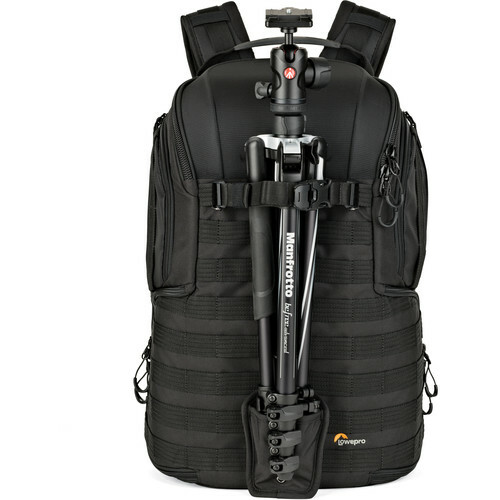 The ProTactic BP 350 AW II professional camera backpack expands upon the rugged versatility and armoured protection the original ProTactic series is known for. 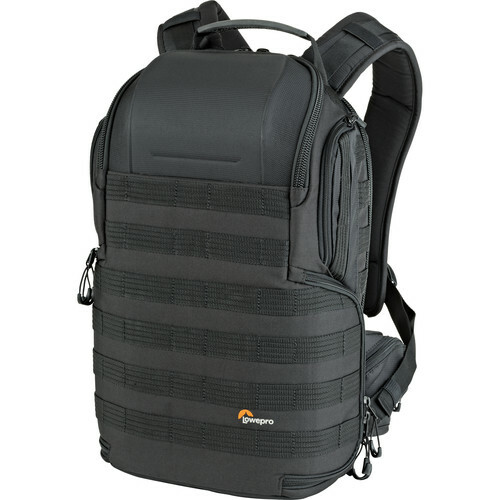 This high-performance second generation offers a more adaptive interior, multiple access points, modular exterior attachment capabilities, convertible utility belt and includes a utility pouch, water bottle holder, tripod cup and two Quick Straps. ActivZone back panel gives targeted comfort and support while All Weather AW Cover protects gear from rain, snow, dust and sand. 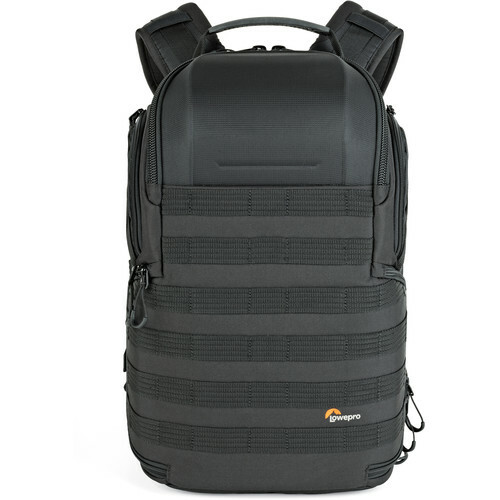 Carry one or two Pro DSLRs, including one with an attached 24-70mm f/2.8 lens, in this black ProTactic 350 AW II Camera and Laptop Backpack from Lowepro. 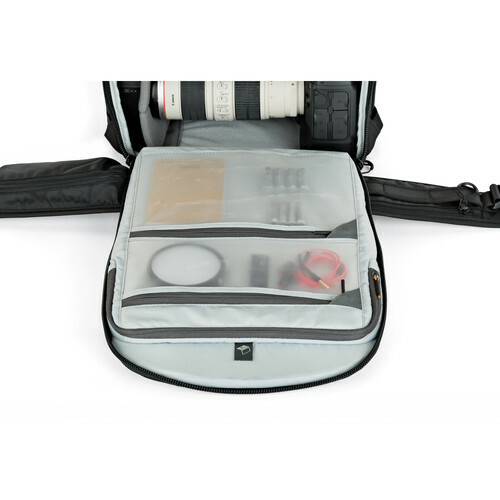 Updated from the first generation to expand its protection and versatility, this bag will also accommodate eight additional lenses or flash units, as well as a tripod, and a 13" laptop. Four access points at the top, sides, and back help you to organize your gear and quickly grab it to get a shot. Create customized configurations with the SlipLock-compatible strap system and adjustable interior dividers. 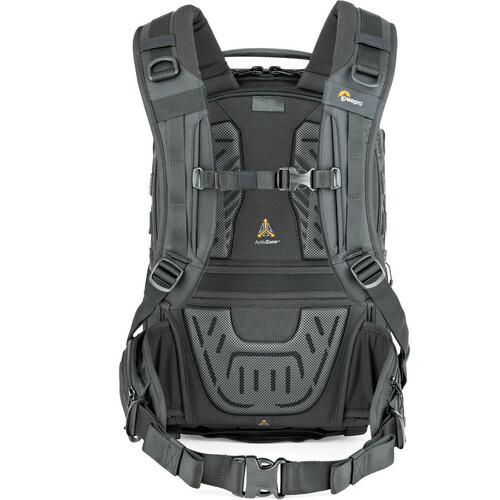 The ProTactic 350 AW II provides targeted comfort and support with its ActivZone System harness, which includes a waist belt that is easily removable for storage and travel. 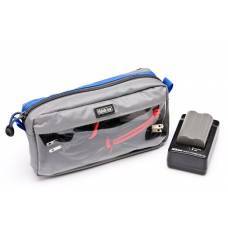 Additionally, the bag offers a built-in, all-weather cover to safeguard your gear against the elements. Five included modular accessories, including a water bottle pouch, accessory case, tripod cup, and two cinch straps, are all SlipLock-compatible. 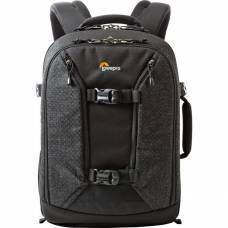 Accommodates 1-2 Pro DSLRs, including one with an attached 24-70mm f/2.8 f/2.8 lens, plus 8 extra lenses or flash units, a tripod, and a 13" laptop. 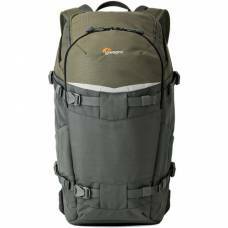 Four access points at the top, sides, and back help you quickly and organize your gear or grab it to get a shot. Adjustable interior dividers for a snug, secure fit and easy customization. SlipLock-compatible strap system and modular accessories, including a water bottle pouch, accessory case, tripod cup, and two cinch straps. 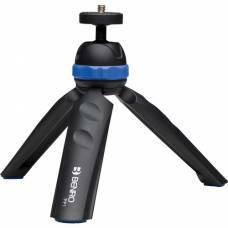 Add a tripod or monopod to the outside of the bag using the included cinch straps and tripod cup. 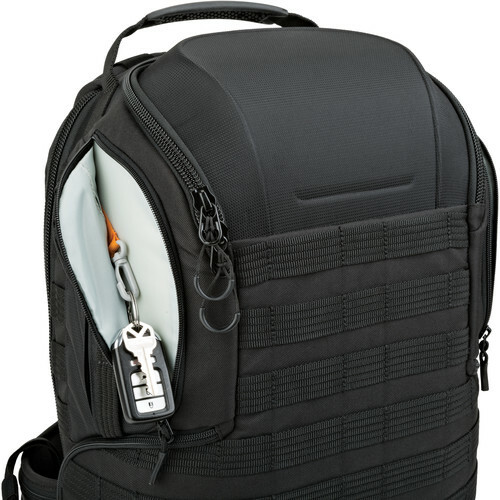 Keep accessories neat and organized with multiple interior and exterior pockets that allow easy access. Quickly grab gear via a top, side, and full body side-access pockets. 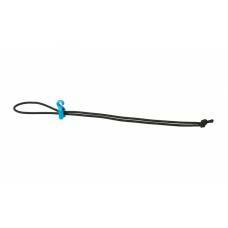 ActivZone System harness delivers targeted support at shoulder blades, lumbar area, and waist for comfort on the move. 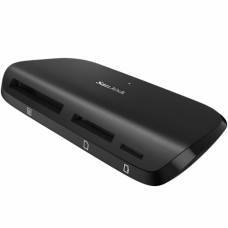 Includes a waist belt that's easily removable for storage and travel. Padded. Practical. Lightweight. 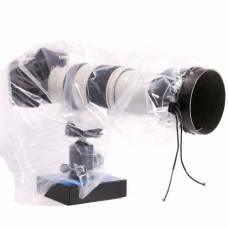 Includes a removable rain cover. 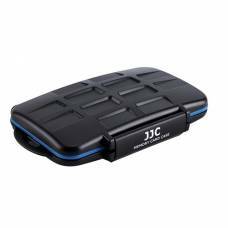 Designed to go off-road, store and protect your photography gear, tablet, and personal items in this.. 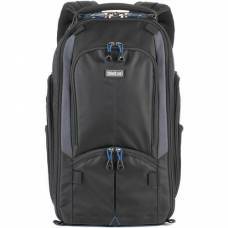 Built for timeless functionality, this Lowepro Pro Runner BP 450 AW II is a professional-size back.. 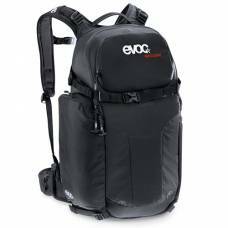 This comfortable urban StreetWalker photography camera backpack will protect your gear while you explore the city.